5. Multiply a whole number of up to four digits by a one-digit whole number, and multiply two two-digit numbers, using strategies based on place value and the properties of operations. Illustrate and explain the calculation by using equations, rectangular arrays, and/or area models. Read chapter 1 of The Hobbit aloud to students. After reading it, recap that there are 13 dwarves, plus one hobbit and one wizard. Students should then get a sheet of notebook paper and a pencil out. 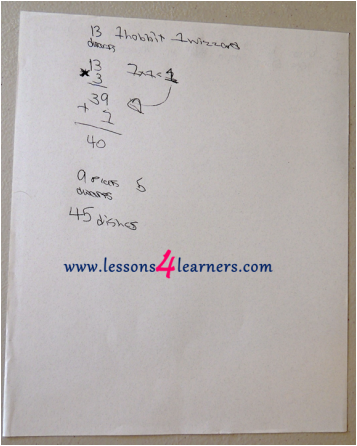 Explain to students that you will be working on some multiplication equations inspired by The Hobbit. The teacher should then invite students to complete multiplication equations spoken or written in word problem form, inspired by the unexpected feast in chapter 1 of The Hobbit. If there are 4 seed cakes for each dwarf at the feast, how many seed cakes must Bilbo prepare? Gandalf blows 1 smoke ring for each dwarf and 2 smoke rings for each hobbit in attendance. How many smoke rings does Gandalf blow? There are 6 dirty plates for each member of the feast, not including Bilbo. How many dirty plates are piled up in Bilbo’s kitchen? Balin, Dwalin, Bifur and Bofur threw 11 plates after they were washed. How many total did they throw? Record the accuracy and work of the Hobbit math equations. J.R.R. Tolkien reading a passage from his work THE HOBBIT, along with great illustrations by Alan Lee. Born John Ronald Reuel Tolkien in 1892, JRR Tolkien (his pen name) was a professor at the University of Oxford as well as a philologist and famous author. Works such as The Hobbit and The Lord of the Rings are some of his most famous which are bursting from the seams with elves, goblins, wizards, trolls and more. Tolkien is arguably the most notable and influential fantasy genre author in recent history. Tolkien has published numerous works throughout the last half-century and has been regarded as one of the literary world’s greatest treasures. A smart man, and good friend to fellow author C.S Lewis, he was also a soldier and father. The Hobbit began as a bedtime story for Tolkien’s young children, as he masterfully wove elements of ancient languages with vibrant settings for the fictional characters in his tales. The setting of Middle Earth, for example, was a nod to the poem Crist which includes a passage referring to the ancient concept of a world between heaven and hell: Middle Earth. Bilbo Baggins, the main character in The Hobbit is a complex sort of creature with hairy feet and a desire for comfort and consistency. His life is turned upside down when the wizard Gandalf comes to the door of his hobbit house one fine morning and leaves a peculiar scratch upon it.